Cpl. Mustafa Tabash is two weeks away from completing the Tank Commanders' Course. The IDF is about to receive its first Bedouin tank commander. While about 1,000 Bedouin Arabs serve in the IDF, most of them serve as trackers, or in the Bedouin reconaissance battalion. Cpl. 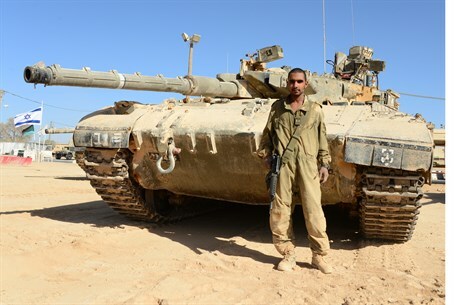 Mustafa Tabash will become the first Bedouin tank commander in two weeks' time, once he completes the Tank Commanders' Course, reports the IDF Website. About one in nine Bedouin men serve in the IDF. Tabash knew in high school that he intended to serve, but he planned to serve in one of the military's academic tracks. He was accepted to this track – but then changed his mind. “Serving behind a desk was not my expectation of myself,” he explained. “I wanted to be a combat soldier." He enlisted to the Tank Corps, in the 7th Brigade, and served on a tank crew as a loader – the crewman who loads shells into the tank's main gun. The Tank Commanders' Course is not a walk in the part, he admits. Tabash says his family is proud of him – “My little brother sees me with the uniform and weapon and he gets all excited” – and that he wants to go on to become an officer in the Armored Corps.